Sports Media Gaming are thrilled to announce today that it has brokered a three and a half year global partnership between FXPRIMUS and Premier League Champions Manchester City. 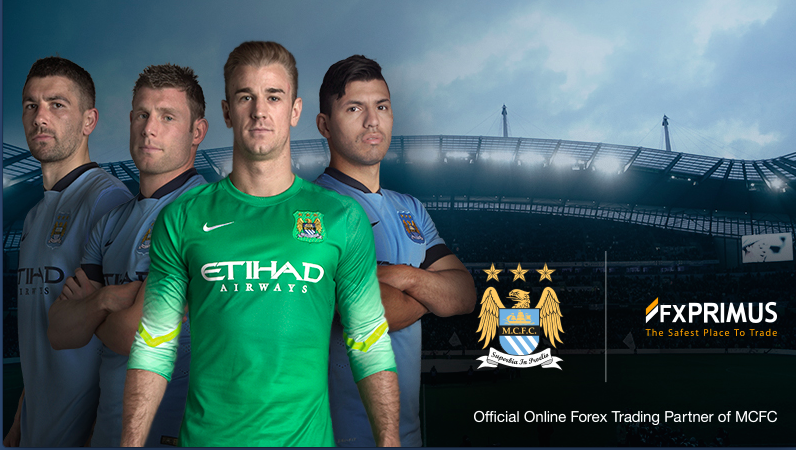 FXPRIMUS will become Manchester City FC’s Official Global Online Forex Trading Partner. The first major activation of the partnership will be at the club’s winter training camp in Abu Dhabi where Manchester City will compete with Hamburg SV of the Bundesliga for the FXPRIMUS Cup on 21 January in Al Ain. FXPRIMUS will also be the Official Partner of Manchester City FC’s January 2015 UAE Tour. The wide-ranging agreement will see FXPRIMUS acquire extensive marketing and promotional rights including presence across the club’s extensive digital channels. FXPRIMUS will also be a regular presence at the Etihad Stadium, with hospitality at all home games. Thompson continued “In analysing a potential relationship with Manchester City FC, we discovered many of our clients are also football fans, so it gives us great pleasure to bring them this sponsorship. We intend on offering many interactive ways for our clients to participate in this partnership, because ultimately this is for them. Stephen Pearson, SMG's CEO added "I am extremely pleased to have brokered this deal and be managing the partnership for FXPRIMUS."